It’s a relatively quiet Saturday night in the NHL, with only a half-dozen games on the schedule as the league gears up for a busy New Year’s Eve slate tomorrow. Four of the seven Canadian teams have the night off, while three others are in action and chasing a playoff spot…. Kind of. Did you have a good holiday? Looking forward to your New Year’s party? Good. Have your fun while you can. Because for some teams, this is the part of the NHL season where things start getting desperate. Coming into this week, the Senators hadn’t played the Bruins yet on the season. But the post-holiday schedule served up a pair of games right up front, one in each city. It was basically a home-and-home, albeit an odd one split up by each team having a game squeezed in between their two meetings. And it represented a great opportunity for a Senators team that’s been desperate for one. With the entire Metro clogging up the wild-card race, Ottawa’s best path to the playoffs looks like it involves catching either the Bruins or Maple Leafs for third place in the Atlantic. That’s a tall order; the Sens came out of the break 13 points back of Boston and 14 behind Toronto. But sweep two regulation wins against the Bruins, and you get the gap down to single digits. That’s still a ton of ground, but at least it starts feeling manageable. And so the Sens headed into Boston on Wednesday night looking to start their journey of a thousand miles with a single step. Instead, they stumbled through a 5-1 loss. And now, the situation feels critical. One regulation loss was a missed opportunity. Another might all but slam the door on catching the Bruins at all. That’s not quite must-win territory – even if the Bruins pull away, there’s still the Maple Leafs or the wild card. Those may be better options no matter what happens, as the Bruins have quietly been one of the league’s better teams for much of the first half. They haven’t received enough credit for that, partly because their early record didn’t live up to how they were playing and partly because they spent the first few months having multiple games in hand on just about everyone. If you were only looking at the points column, they were an easy enough team to ignore. They’re not being ignored anymore; five straight wins tends to do that. And it’s largely the young guys who are driving that success, with players like David Pastrnak, Charlie McAvoy and Danton Heinen exceeding expectations. Brad Marchand keeps scoring, Patrice Bergeron and Tuukka Rask keep making sure you can’t score, and the Bruins keep winning. None of that is good news for Ottawa, a team whose struggles on and off the ice have been well-documented. Most playoff bubble teams have a tough time withstanding a four game losing streak; the Senators just ended their third in six weeks. And in the middle of all of that, they need to somehow find a way to win tonight. If there’s any good news from an Ottawa perspective, it’s this: The Senators should be desperate. We should see them come out with all guns blazing. Given the disparity between the two teams, that still may not be enough. And if it doesn’t happen, it will be fair to start asking some tough questions about the makeup of this team. You certainly can’t say that the stakes aren’t high heading into tonight. Or maybe it’s already too late, none of this matters, and it’s all about Rasmus Dahlin at this point. There’s that angle too. As far as I can tell, a lot of Senators fans are already there. Either way, tonight is a chance for the Senators to make a statement. Maybe one of their last. The year is over, so now seems like a good time to hand out some awards for the past 12 months of NHL action. I mean, the year isn't over over. There's still four days to go. But the odds of anything really interesting happening in any four-day segment of the NHL regular season are minimal, so we feel safe in jumping the gun just a bit. 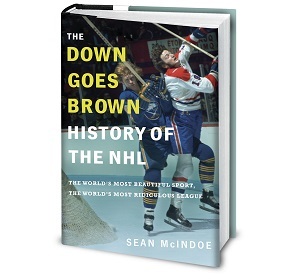 So today, it's over to Dave Lozo and Sean "Down Goes Brown" McIndoe, your two cranky uncles from the Biscuits hockey podcast. VICE Sports asked them to hand out some Best and Worst awards, and after taking the time to explain the concept of actually liking something to them, they agreed. Here's what they came up with. This is a relatively easy one. You could make a case for Sidney Crosby, who got another ring. Maybe you argue for a non-forward like Erik Karlsson or Sergei Bobrovsky. Maybe you take a stand for a better-than-you-think case like Nikita Kucherov or even Brad Marchand. You could make all of those cases. And we'd listen quietly, nod politely, and then give the award to McDavid anyway. Do you think the "valuable" in most valuable player is just a fancy way of saying the best player in the league? Cool, then that's McDavid, who is still two years away from his prime and already does things that nobody else can do. Or do you prefer the old-school definition, that measures a player's importance to his specific team? In that case it's even easier, because McDavid got the Oilers to the playoffs in his first full season. When he's not on the ice, Edmonton still often looks hopeless. But the Oilers are going to rebound from their terrible start and make the playoffs anyway, because McDavid will drag them there. Rinaldo spent all of the 2016-17 season in the AHL, then was demoted to the Arizona Coyotes over the offseason. The result: One goal, three points, one sucker punch, and (presumably) yet another big suspension. Nobody's defending Rinaldo these days. (OK, fine, almost nobody). In fact, just about everyone is lining up to be the loudest voice tearing him apart. And it's well-deserved, because Rinaldo has more games worth of suspensions over his career than goals scored. He's the sort of player who used to have a role in the NHL, and increasingly doesn't anymore. We'll see if there's still a place for him when he gets back from his latest suspension. We're going to have to wait a while. John Gibson (.930) and Sergei Bobrovsky (.926) are 1-2 in save percentage; Braden Holtby (47) has nine more wins than the next-closest goaltender and Cam Talbot's workload last season was a big reason why the Oilers won so many games, but Rinne's work in the regular season and postseason gives him the edge. In the 2017 calendar year, he's fourth in wins (36) and save percentage (.922) and posted a .930 save percentage in the playoffs as the Predators came within two wins of a Stanley Cup. Rinne is in the mix for the Vezina Trophy this season, as he entered the holiday break 18-6-3 with a .923 save percentage. - Should the NHL play on Christmas? Our annual trade grades post continues today, as we look back at every deal from 2017 that involved at least one player. Yesterday, we went through the Eastern Conference. Today, it’s the West’s turn. Best deal: It’s early, but so far the Sami Vatanen-for-Adam Henrique seems like a classic case of two teams both using an area of strength to patch holes in the lineup. Worst deal: Giving up Shea Theodore for expansion draft considerations. On its own, the move works, since it allowed the team to keep Vatanen and Josh Manson. But it highlights the fact that the Ducks were as poorly positioned for expansion as just about anyone, and couldn’t find a way to avoid paying a price for it. To be determined: Just how much the first-rounder they gave up for Patrick Eaves comes back to bite them; the fact that he re-signed eases the pain a bit. Overall grade: B-. Bob Murray worked hard, and probably salvaged as much as he could from a brutal expansion situation. Best deal: John Chayka managed to turn Martin Hanzal into one of the deadline’s biggest names, and reaped a windfall for doing so. Worst deal: The Derek Stepan/Antti Raanta deal signalled that the Coyotes were ready to move into win-now mode. Their start to this season signalled that they were not. To be determined: Whether Niklas Hjalmarsson can get back on track; that deal looked like a steal for the Coyotes at the time. Total trades: Fourteen, tying the Canadiens for the league high. Overall grade: B. Chayka made lots of deals, several of them big – we didn’t even mention Mike Smith – and he’s clearly not intimidated despite his relative youth and lack of experience. But the disastrous start to the season calls into question whether the Coyotes were addressing the right areas. Best deal: Getting Mike Smith from the Coyotes. I was skeptical at the time, but so far Smith has been exactly what they hoped they were getting. Worst deal: As mentioned yesterday, giving up a second for Curtis Lazar seemed like a major overpayment on a longshot gamble. To be determined: Whether Travis Hamonic can settle in; they’d better hope so, given the price they paid to get him. Overall grade: B. But if Hamonic gets back to his Islanders level, this could move into the A- territority. The NHL’s holiday trade freeze ends at midnight tomorrow. That leaves the league’s GMs with four more days to get any last-minute deals into the “2017” file. This year, it sounds like some teams might be looking to do exactly that. But most will probably call it a year. These days, trades are relatively rare in the NHL, with many teams going an entire year without making any moves of any real significance. And that’s all the more reason to celebrate the deals we do get. So today, as NHL GMs enjoy their last few days off before having to answer their phones again, it’s time for our annual trade grades column, in which we hand every team their marks for all the deals they’ve made over the course of the calendar year. One ground rule: As always, we’re only counting trades that involve at least one actual player. That rules out the kinds of pick-for-pick trades that happen on the draft floor, since those are typically more math exercises than actual hockey trades. This year, that also means we’ll be skipping some of the Golden Knights’ trades that fell into the “draft pick for expansion draft considerations” category, since the league in its infinite wisdom decided not to tell us what those considerations were. That still leaves us with plenty to work with, even if most of the deals fall well below the blockbuster level. Today, we lead off with the Eastern Conference. Tomorrow, it’s on to the West. Best deal: Getting Trevor van Riemsdyk for a second-round pick from Vegas at the expansion draft. He’s been a decent fit on a team already flush with young blueliners. Worst deal: Getting Marcus Kruger for a fifth hasn’t yielded much yet, although it also didn’t cost much. To be determined: Scott Darling hasn’t looked great in Carolina so far. But he only cost them a third-rounder, so we’ll hold off on judging that deal for now. Overall grade: A-. The Hurricanes did some nice work, both as deadline sellers and offseason buyers. But this grade will look too high in hindsight if Darling doesn’t come around. Best deal: Artemi Panarin for Brandon Saad is one of those fun deals we’ll be debating for years to come, but for now it’s advantage Blue Jackets. Worst deal: Sending prospect Dillon Heatherington to Dallas for Lauri Korpikoski. The Jackets’ deadline was a bit of a dud given how strong their season had been, yielding only Korpikoski and Kyle Quincey. Neither stuck around, but at least Quincey saw the ice during the playoffs. To be determined: Whether giving up a first and a second was worth unloading David Clarkson’s albatross of a contract on the Golden Knights. Overall grade: B+. A stronger deadline push would have been nice, but the Panarin deal takes away some of that sting. Best deal: While there were smaller pieces involved, getting Sami Vatanen from the Ducks for Adam Henrique felt like an old school hockey trade, and it’s one that should end up being a win for both teams involved. Worst deal: Giving up a second and a fourth for Mirco Mueller and a fifth seemed like an overpay at the time, and remains so today. To be determined: Whether Marcus Johansson can get back to being healthy and productive. It looked like the Devils had taken the cap-strapped Capitals to the cleaners when they landed Johansson for two picks in the offseason, but so far it hasn’t paid off like we thought. Overall grade: B. Ray Shero knows what he’s doing, and the standings show it. Tonight brings a packed schedule featuring the maximum 15 games, as the league crams in as much action as possible before shutting down the schedule for three days over the holidays. The Flames are the lucky team that gets the extra night off, while the country’s other six teams are in action, including one all-Canadian matchup. We’ll start there. When these two teams met in Montreal two weeks ago, we wrote about how their respective struggles had dominated so much of the early season storytelling. That game seemed to represent a chance for one team to earn a big win, maybe even the kind that can launch them down the long road back into playoff contention. It was the Oilers who got it, thumping the Canadiens by a 6-2 final to earn their fourth win in six games, while sending Montreal to their third straight loss. And while Oilers sputtered to a 1-0 loss in Toronto the next night, they’ve won four of five since and are currently riding their first three-game win streak of the season. Meanwhile, the Canadiens won three of their next four. Two weeks after the meeting, both teams are largely in the same place they were before, with the Habs chasing the Bruins and the Oilers still looking up at a long list of teams out West. So let’s call this take two. Who needs the win the most? And more importantly, who can’t afford to go into the holidays without a point? On paper, the Canadiens are still in slightly tougher shape. They’ve lost ground to the Bruins lately, partly due to Boston finally make up some of those games in hand they’ve been holding over the rest of the division. And while Montreal is sitting in fourth place in the Atlantic, they’re now trailing the entire Metro, meaning the wildcard isn’t in the picture for now. They’re also in the midst of a brutal seven-game road trip, and with Shea Weber’s foot injury seeming more and more like it could be a long-term concern, the immediate picture looks cloudy. It wouldn’t take more than a loss or two combined with Bruin wins before that third Atlantic spot started to drift out of reach. As for the Oilers, they’d need to play at a 106-point pace over the season’s last 47 games to get to the 95-point mark that we typically think of as the playoff finish line. That would be daunting for any team, especially one that’s still plugging along under the .500 mark, but the Oilers have the talent to make it happen. But with six teams to pass, they’re running out of time to flip the switch. Like the Habs, it wouldn’t take much of a short-term slump to torpedo the long-term hopes. After slow starts, neither team has much of a margin of error to work with here. It’s cliché to talk about games where both teams need a win, as if there are many games where one team would be fine with a loss. But sometimes, both team really need a win, and with a break in the schedule looming, this would seem to be one of those games. - But seriously, what's wrong with Eugene Melnyk? - We take on that weird NHL Network list of the best captains. One of us loves it. The NHL officially has officially turned 100, as today marks exactly one century since the league took to the ice for its first two games way back in 1917. It’s been a long road from there to here, and there were more than a few times that it looked like the league wouldn’t make it. But here we are. Happy birthday, NHL. So what do you get for the league that has everything? Let’s go with a ranking of every season. That’s right, all of them. Comparing eras across a century is tricky, to say the least, and most of us will probably point to whenever we were kids and say that was the peak. A lot of this is personal taste. Do you like lots of goals or low-scoring hockey? Is the presence of one dominant team that runs over everyone a good or a bad thing? How do you even begin to compare the 1920s to today’s modern game? And of course, maybe most importantly, how did your favourite team do that year? Your list would probably look very different from mine, and coming up with something everyone will agree on is next to impossible. But that never stopped us before, so here we go. We’ll count down from worst to best, meaning we’ll have to start at the league’s rock bottom. I’m guessing this is the one pick we might all agree on. The season that wasn’t. To this day, the NHL remains the only league in major North American pro sports to lose an entire season to a work stoppage. The NFL, NBA and even MLB never did it. But Gary Bettman, the owners and the NHLPA found a way, and there’s a blank panel on the Stanley Cup to remind us of that. Today this season summons some nostalgia as the first of the Original Six era. But by 1942, the NHL has been decimated by the war, with many players serving overseas, local curfews impacting the product, and dismal economic conditions. At one point, there’s even talk of temporarily shutting down. The Rangers probably wish the league had, as they suffer through one of the worst seasons in the history of sports. And to make matters worse, the league loses the only president it’s ever had when Frank Calder dies. What’s the right amount of scoring for an NHL season? Everyone has their own opinion, but surely we can all agree that four goals a game or under — that’s for both teams — is unwatchable. That’s where the league is during the 1927–28 season. By 1928–29, the rate has fallen under three, and of the 220 games played that year, 120 end in a shutout. The result is a major rule change: Finally allowing the forward pass in all three zones beginning with the 1929–30 season. In terms of historical significance, few seasons can hold a candle to the league’s very first. But this was also nearly the last, as the new league comes close to collapsing within weeks of opening night. There were only four teams to start with, and that number shrinks to three when the Montreal Wanderers’ arena burns down and they fold. The unnamed Toronto team eventually wins the league title, but the bigger story is that the league survived at all. The league shrinks for the first time since the Wanderers arena fire, losing a founding member in the Senators as well as the Philadelphia Quakers, which temporarily overshadows the opening of Maple Leaf Gardens. Do we penalize this season for having the Stanley Cup series wiped out by an influenza outbreak? Remember, the Cup wasn’t technically part of the NHL season back then. Still, it was a difficult ending to a rocky second season for the league. The first lockout season squanders the momentum the league had been building. The Nordiques move south at the end of the season, and the Jets are expected to be right behind them until getting a one-year reprieve at the last minute. Even the Devils are reportedly on the verge of heading to Nashville. They shrug that off to win their first-ever Cup, but usher in the era of the neutral-zone trap in the process. This was supposed to be a chance for Ottawa to steal the spotlight on one of the league’s biggest weekends of the year. With the NHL celebrating its 100th anniversary, Ottawa welcomed the hockey world for the season’s first outdoor game, as well as an alumni game and other events at a beautiful second rink at Parliament Hill. Even with the Senators struggling, this was a chance to put all that aside and let a market that so often plays second fiddle to Montreal or Toronto have its chance to be front and centre for all the right reasons. But apparently Eugene Melnyk had other ideas. The Senators’ owner was the story of the weekend, overshadowing the game itself with his Friday night comments in which he complained about attendance and suggested that payroll was too high. And, in the biggest headline, he told reporters that he’d never sell the team, but might be open to moving it. After everything else they’ve been through this year, you could forgive Senators fans if they heard Melnyk’s musings and headed straight for the bar. Judging by the reactions on social media and radio call-in lines, more than a few did. But let’s be clear on a few points. First, Melnyk’s comment about moving was conditional on “if it becomes a disaster,” and he acknowledged that the situation isn’t there yet. More importantly, an NHL owner can’t just pick his team up and move it whenever the whim strikes. Despite the comparisons Melnyk himself tried to draw, an NHL franchise isn’t a McDonald’s or a grocery store. There’s a reason that we’ve only seen one team move in the last 20 years, despite many of the league’s markets being far worse off than any worst-case scenario you could conjure in Ottawa. If Melnyk can’t make it work then the league would look high and low to find someone else who could before they’d consider abandoning a market they’ve spent a quarter-century cultivating. Eugene Melnyk just threw his fan base under the bus. Perhaps, the same bus you have to take to get to the next bus which takes you to the third bus that takes you to the games. #Senators. So what’s Melnyk’s game here? Clearly, he’s disappointed by this year’s attendance numbers, especially after last year’s run to the conference final. Maybe he thinks that a threat of a move hanging over things will spur fans to reach into their wallets, instead of heading in the other direction by just tuning out altogether. It’s a bold strategy — let’s see if it pays off. It’s impossible not to wonder how all this is playing in the Erik Karlsson camp. The star defenceman was reportedly reprimanded for speaking out publicly about the possibility of playing elsewhere; now the owner can launch into a tirade about moving the entire team? Star players in this league usually end up re-signing rather than testing the open market, in large part because they value stability. This situation doesn’t seem all that stable anymore. Meanwhile, the hockey world came to Ottawa this weekend, and left with headlines about “dark clouds“and a “circus.” That’s probably not what Melnyk had in mind when he was boasting about putting on the greatest outdoor game yet. With all that going on, the mood in the capital felt dour heading into the weekend. But the alumni game was fun, the pre-game fan fest attracted a solid crowd, and the weather was cold but otherwise cooperated. By the time Saturday rolled around, a sellout crowd (helped along by plenty of Habs fans) seemed ready to set aside Melnyk’s rant and enjoy a game. They were rewarded with a low-scoring but reasonably entertaining contest, one that ended with a 3–0 Ottawa win. Karlsson was the driving force for Ottawa, playing an outdoor-record 32 minutes while still finding time to get weird. That makes it two straight for Ottawa, which isn’t much but sure beats losing 11 of 12. Their owner says we should trust him when he calls them a playoff team; today, they’re six points back, which is a healthy gap but not insurmountable. Meanwhile, the Habs have lost four of five and are just three points up on Ottawa, who hold two games in hand. It’s looking more and more like the Atlantic may produce only three playoff teams, so there isn’t much room for error here. That may be bad news for a Montreal team that plays its next six on the road. But look on the bright side, Habs fans. Your playoff hopes may be fading, and your team just got shut out in front of a leaguewide audience. But at least your owner hasn’t threatened to make off with the franchise you’ve spent decades supporting. Yet. 5. Washington Capitals (21-12-1, +8 true goals differential*): Look who’s back in the top five for the first time since Week 1. They’ve won 10 of 12, including three straight, to move into top spot of the still-way-too-crowded Metro. 4. Los Angeles Kings (20-10-4, +20): Three straight losses opened the door for the Knights to retake the Pacific lead. Who wants a cold one? Tonight marks the return of outdoor hockey, as the Ottawa Senators and Montreal Canadiens meet at Lansdowne Park. It’s also a rare Saturday night without the Toronto Maple Leafs or Vancouver Canucks, while the three remaining Canadian teams get a tour of the Central. There isn’t much question over where most of the attention will be turned tonight, as the Habs and Sens take it outside at Lansdowne Park in what’s been dubbed the NHL 100 Classic. The game commemorates the meeting between the Canadiens and the original Senators in one of the first two NHL games ever played, way back on Dec. 19, 1917. But while you can expect to see plenty of history on display, we can forgive these two teams if they’re focused squarely on the present. That’s especially true for the Senators, who desperately need a win to build some momentum after a brutal few weeks that’s seen them lose 12 of 14 to plummet well out of the playoff race. With rumours swirling of major changes on the way – and their GM being forced to deny that he’s about to fire the coach – the Senators are a team that desperately needs to start making up some ground. They took the first step towards that on Wednesday with a win over the New York Rangers. The two points were important, but the way they were earned them may have mattered even more. Craig Anderson looked strong, Bobby Ryan was a force, Zack Smith finally scored and Matt Duchene may have earned his most important point as a Senator. Almost as important: With a win under their belt, the Senators can now enjoy hosting the franchise’s first outdoor game, or at least go through the process without feeling like they can’t so much as smile. Still, the timing of tonight’s event isn’t ideal. Between the losing, Erik Karlsson’s contract comments, a push for a new arena and rumours around ownership, conventional wisdom would say that the last thing this team would seem to need right now is even more distractions. But on the other hand, maybe that’s exactly what they could use. There are worse ways for an NHL team to forget its troubles than by getting out under the lights for a little pond hockey. And if a big crowd inspires Ottawa to collect a win against a division rival it’s chasing in the playoff hunt, even better. Or they faceplant in front of a national audience. There’s that possibility too. As for the Canadiens, their up-and-down season continues to defy any attempt at analysis. They lost three straight before beating the Devils on Thursday, falling back out of a playoff spot they’d climbed into possession of last week. The way things have been going this year, that means it’s time for everyone to write them off, at which point they’ll run off another win streak and surge back up the standings. Outdoor games are always tough to predict – the puck bounces even more than usual, the weather can affect different players in different ways, and the whole endeavour often feels like it’s taking place as a separate piece of its own instead of as part of a larger season. For these two teams right now, that might be a good thing. The league might want tonight to be all about the past, but if the Sens and Habs can’t start banking wins soon, their playoff hopes might be history. You can call them the NHL’s dirty dozen. Or you could just call them the most disappointing stories in the NHL so far this year. Either way, if you’re a fan of one of the 12 teams below, you probably aren’t picking up much in the way of good vibes these days. That’s life in the NHL, where not every team can meet expectations. But that doesn’t make it any easier to swallow when it’s December and your team is already fading, or worse. In fact, it can be tempting to grab a shovel and pile even more dirt on a team that’s floundering this late in the year. Well, not today. We’re into the holiday season, which is supposed to be a time of charity and goodwill. So let’s stay positive. Let’s take each of the league’s 12 most disappointing teams, and see if we can come up with three nice things to say about them. And for some added fun, we’ll do this in order of difficulty — starting with the easiest teams to say nice things about, and working our way down to the toughest calls. The negative: After going out in the first round for two straight years, the Blackhawks might not even make it to the post-season this time around. They’re currently outside of a playoff spot despite a strong year from Corey Crawford, and their aging core and tight cap situation will make bringing in significant reinforcements all but impossible. We’ve been incorrectly predicting the demise of the Hawks’ mini-dynasty for years now, but this feels like it really could be it. So can we come up with three positive things to say to make Chicago fans feel a little better? Let’s try. Positive thought #1: You won the Stanley Cup in 2010. Positive thought #2: You won the Stanley Cup in 2013. Positive thought #3: You won the Stanley Cup in 2015. Seriously, you could finish dead last for the next decade and nobody will feel bad for you. OK, granted, the Blackhawks were the tutorial level here. Consider that a warmup. Let’s up the difficulty with the next team. The negative: After failing to qualify for the playoffs last year for the first time since 1990, the Wings look set to make it two straight misses. Positive thought #1: The new arena is nice. And you didn’t even have to pretend to be moving to Houston to get it. Positive thought #2: Let’s be honest — the best thing that could happen to the Red Wings would be to bottom out and convince management that it’s time for a full-fledged rebuild. Ken Holland still seems to be resisting that idea, but a 70-point season might leave him with no choice. Positive thought #3: Wings fans might get to watch Steve Yzerman win another Cup this year, so there’s that too. But yeah, it’s mainly the rebuild. The negative: After plummeting out of the playoffs last year, the Stars brought back Ken Hitchcock and finally went out and made the Ben Bishop trade we’d all been waiting for. That seemed to clear a path back into contention for the Central title. Instead, they’re 31 games in and are outside the playoffs in terms of points percentage. Positive thought #1: Hitchcock’s defensive approach seems to be kicking in. The Stars rank fourth in shots allowed per game, and they rank second behind only the Blues in expected goals allowed per 60 minutes of 5v5. Positive thought #3: It was only a few days ago that the Stars were riding a five-game win streak and looking like they had things figured out. A lot can change in a week in today’s NHL, but the Stars still look very much like a playoff team, even if they may not be the top contender we were hoping for. Everyone feeling hopeful? So far so good. Here’s where we ramp up the challenge. As we get settled into the season and the day-to-day ups and downs start to give way to a longer view, it can help to take a step back and look at the bigger picture every now and then. One way to do that is to pick one division and go top to bottom in an attempt to figure out what’s going on. So today, let’s do just that, as we ask the question: What’s going on with the Metro Division? Roughly 30 games into the season, there’s barely anything to separate the top six in the division. There’s just five points between first place Columbus and the sixth-place Rangers – and New York has a game in hand. The Capitals, Devils, Islanders and Penguins are all nestled within two points of each other in between. And right now, all six of those Metro teams are holding down spots in the East’s top eight. That presents a problem, since the NHL wild-card format only allows for five teams from any one division to make the post-season. With the Atlantic struggling to find a third playoff-worthy team, it’s possible that we could be headed towards a sixth-place Metro team getting ripped off. Of course, there’s a way to avoid that scenario: Win enough games that you don’t get stuck in that sixth spot. The Rangers took a big step in that direction on Saturday with a 5-2 win over the Devils that continued an extended hot streak at MSG, where they’ve won 10 of 11. It was a fun revival of a rivalry that’s been low on big games in recent years, and moved the Rangers to within two points of a Devils team they’d trailed by as many as eight at the end of October. That was the Devils second divisional defeat of the weekend, combining with Friday’s 5-3 loss to the Blue Jackets. It’s possible that the Devils are finally looking like the team we expected to see after a hot start; they haven’t won more than two straight since Nov. 1. Their goal differential is now in the red too, so there’s some real reason for concern in New Jersey. If the Devils keep slipping, that opens the door for not only the Rangers, but an Islanders team that’s been quietly putting together a solid season. The Isles just dropped three straight on a tough road trip, but the good news is that they’ll spend seven of the next eight at home, where they’ve only lost in regulation once all year. Meanwhile, the Blue Jackets earned a 1-0 win over the Coyotes that nicely symbolizes a team that seems to specialize in doing just enough to stay in first place. The Penguins lost to the Maple Leafs and continue to spin their wheels, even though everyone assumes they’re just biding their time. And then there’s the seventh-place Hurricanes, who are still lurking six points back despite losing five of six. That covers six of the division’s eight teams; we’ll hit on the other two in a little more depth down below. The five teams that look like they’re headed towards Stanley Cup favourite status. 5. Toronto Maple Leafs (20-10-1, +17 true goals differential*) – They keep finding ways to win even when they’re missing Auston Matthews, playing their backup goalie and getting skated into the ground by Connor McDavid. 4. Columbus Blue Jackets (19-10-1, +11) – This was weird: A struggling Cam Atkinson was a healthy scratch for Columbus on Saturday, just three weeks after signing a $41-million extension. We’re into double digits as we hit the 10th weekend of the NHL season. We’ve got a dozen games on tap, starting in the afternoon and lasting through a trio of late starts. Here’s what to watch for. The Jets are in the middle of what’s been easily their best season since returning to the NHL in 2011. It might be taking a run at 1984–85 for the best Jets season ever, period. That’s not an especially high bar, but Winnipeg fans probably aren’t too worried about nitpicking right now, because for most of the year this team has been all sorts of fun. Even after losing two straight to start this road trip, the Jets are still locked in a three-team race for top spot in the Central. But if there’s been a knock against them, it’s one we covered a few weeks back: they haven’t earned many signature wins. They had that one blowout over the Penguins, and they beat the Pacific-leading Kings, but for the most part their wins have come against a long list of also-rans and quasi-contenders. That’s not entirely their fault, since in today’s parity-soaked NHL almost every opponent will be an also-ran or quasi-contender. But tonight, the Jets get their shot at an unambiguous Cup favourite when they face the first-place-overall Lightning. Tampa’s been dominating the power rankings so far this year, ours included, and it’s not hard to see why. They’re stacked with talent, they score a ton, and they’re racking up wins. And they’re earning them — they’re the only team in the league right now that’s outscoring the opposition by better than a goal a game. They’re good. The Jets are good, too, but you can forgive the hockey world for being a little bit slower to buy in. That could change with a strong showing tonight. We won’t go crazy and use words like “potential Stanley Cup final preview” here, but we reserve the right to change our mind if the Jets can go into Tampa and dominate. And if seeing how the young Jets match up with the Lightning isn’t enough proof for any skeptics out there, stand by. Next weekend brings a home-and-home showdown with the Blues, and that’s followed by a game against the Predators. The Central picture is about to get a whole lot clearer, and for once the Jets have a chance to control how they fit into it. - Should fans believe the annual Forbes report on NHL franchise values? - Reader questions, and lots more. Late in Saturday’s game against the Maple Leafs, the Canucks watched as James van Riemsdyk tipped home a Morgan Rielly shot to cut Vancouver’s lead to 2–1. While the Maple Leafs pressed hard over the final few minutes, the Canucks ultimately held on for the win. In terms of the outcome of the game, the goal didn’t end up mattering. But in terms of history, it did matter. It mattered a lot. Forget about the Canucks honouring Daniel Sedin for hitting the 1,000-point mark. That was impressive and all, but there are 87 members of that club. It’s not all that rare. Sedin isn’t even the first to accomplish the feat among people with his exact DNA sequence. No, we’re talking about real history. Somebody who has a chance to enter truly uncharted territory. We’re talking about Jacob Markstrom‘s shutout streak. Or more specifically, we’re talking about his lack-of-shutout streak. Markstrom has now played 128 NHL games without one. That leaves him just four games short of matching Pokey Reddick’s all-time record for most games played in a career without recording so much as a single shutout. When you think about it, that’s pretty amazing. Reddick’s 132-game career was played between 1986 and 1994, which largely overlaps with the highest-scoring era in NHL history. Markstrom’s streak dates back to 2010, meaning it takes place entirely during the Dead Puck Era. It shouldn’t be possible for a modern player to break a 1980s record for goaltending futility; that would be like somebody coming along today to challenge Wayne Gretzky’s scoring marks. And that makes Markstrom’s streak an accomplishment worth recognizing, even celebrating. Preferably now, before he inevitably gets a shutout in the next few starts and ruins it. So today, let’s take a look at Markstrom’s quest for the record from a couple of different angles. And we’ll start with the man he’s chasing. If you were around during those days then you already know that, but it’s worth noting just in case. He was small even for his era at just five-foot-eight, meaning he had to actually move his limbs to make a save, which made him all sorts of fun to watch.